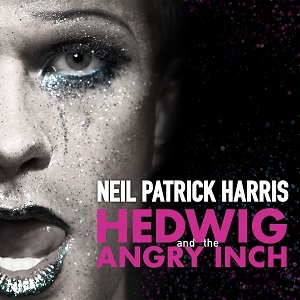 Hedwig and the Angry Inch is a rare sort of musical that premiered in a commercial Off-Broadway production that went on to have multiple regional/international productions (many of which got cast recordings) and a screen adaptation without benefit of a Broadway transfer. Little Shop of Horrors and The Fantastiks are the only other members of this club that come to mind. But if Hedwig‘s success was always more “niche” or “cult” than mainstream, the new Broadway production proves that Hedwig has broad appeal–it has been playing to capacity houses, had a Beyonce-level award haul, and recouped its investment in a matter of months. I can’t attest to the success of the production as a whole (though many people I greatly expect all agree that it’s nearly flawless), but I can say that it has received a wonderful cast recording. The orchestration/mixing of the Broadway band sounds fuller and richer than it’s original downtown counterpart. It doesn’t come off sounding cheesy or sanitized, though I might describe it as “cleaner”, in that I can more clearly hear the individual instruments and whatnot. “Sugar Daddy” is the only song that got a somewhat drastically different musical treatment, losing it’s original country twang (and being better for it). In an interview with buzzfeed (ugh, I know) Stephen Trask has said of this recording: “The intent was to feel as close as possible to what the show sounded like live,…We really wanted to capture what makes this show special, and what makes this version of these songs my favorite.” While I don’t think this will replace JCM on the OOBCR for long-time fans of the piece, I do imagine there is a younger generation for whom this will be the definitive Hedwig, and it does a nice job of preserving this, perhaps unexpected, phase in Hedwig’s history. Hawks Test Report Card: I hope one of the side effects of this production/recording is that it’s wholesome star and clearer sound will enable more conservative listeners (the type who might say the original version “was just noise”) to appreciate how truly excellent Stephen Trask’s work is. It;s truly one of the strongest scores of its decade, with no weak spots and many bona fide classics: “Tear Me Down”, “Origin of Love”, “Wig in a Box”, and the truly wonderful “Wicked Little Town” (which works just as well in completely different musical contexts). *This album is technically called the “Original Broadway Cast Recording”, but I feel that is misleading because it is not the Original Cast…it is just the first cast to play Broadway. Now get off my lawn.